This seven-piece brass, funk and rock band ﻿will make you want to get up from your seat and dance! The August 16 concert features the Po' Boys. 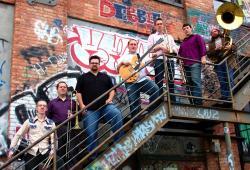 The band’s current lineup of musicians features Eastman School of Music alumni and current students, including a radio announcer, country singer, doctoral candidate and even a dean.